Wondercide products, like Flea & Tick Control for Pets + Home, are completely safe to use around your home, children and pets. However, cats are naturally more sensitive animals, so we recommend testing a small amount of product first, then observing for signs of cat sensitivity. 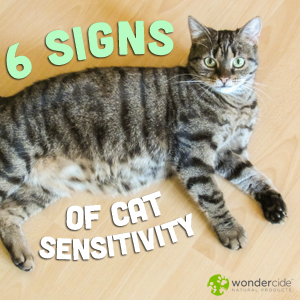 Here’s what you should look for, and what to do if you cat shows signs of sensitivity. What are the signs of cat sensitivity? Cats are naturally more sensitive than dogs. When a cat has a “sensitivity” to Flea & Tick Control for Pets + Home or any other Wondercide product, this does not mean your cat has been poisoned or exposed to toxins. Instead, “sensitivity” often means a gastrointestinal (GI) response has occurred. Because cats groom themselves regularly, they tend to ingest whatever is on their fur. Some cats, especially those that are old, have more sensitive digestive tracts, so they may have a GI response after product is applied. The most common GI response is excessive salivation. Other signs include decreased energy or appetite, runny stool or vomiting, and red eyes. These symptoms could also be signs of over-dousing—spraying the cat with too much product. If you find it necessary to use heavy doses or require frequent applications in order to keep fleas or ticks off your cat, this could indicate a pest infestation. In these cases, we strongly recommend treating the environment to eliminate pests in your home or lawn. Because the flea life cycle is four stages, 95% of fleas in an area are invisible to the human eye! Remember, signs of cat sensitivity are not a toxic response. Flea & Tick Control for Pets + Home contains only food-grade, generally recognized as safe (GRAS) ingredients, so the spray will not harm your cat’s stomach, liver, kidneys, or other internal organs. It is not known to cause short or long-term internal damage. Immediately stop spraying Flea & Tick Control for Pets + Home and any other products on your cats. Consider bathing your cat with a mild soap to wash away the product. Your cat should return to normal behaviors within 24–48 hours. If symptoms persist or worsen, consult your veterinarian. Continued symptoms could indicate other health issues. What should you do to eliminate pests if your cat has sensitivities? If you’re fighting an active pest population, use Flea & Tick Control for Pets + Home in your home and Flea & Tick Control for Yard + Garden on your lawn to treat the environment and eliminate the root of the pest problem (bugs originate outside, after all). If you don’t have fleas in your home or lawn and want to use Flea & Tick Control for Pets + Home as a preventative, lightly mist your cat 2–3x per week or as needed to protect your cat from getting fleas and ticks. Well, to be honest, it sounds a little too good to be true. I mean, a mist to kill fleas, ticks, and other nuisance insects? Don’t get me wrong. I’ve tried the normal topical treatments, like so many other pet lovers. Frontline, Pet Armor, Advantage. But I really never liked to put that stuff on them. If somehow they got it into their mouths, it was like watching a little kid tasting a nasty food. Then I got scared enough to catch them and wipe it off with a wet rag. That’s IF I caught them. Now you’re telling me that there’s a simpler, safer way to treat my lil’ ones?!? I am skeptical, if you can’t tell. But I am willing to try it. So thank you in advance, if this works for them. Hi Charles! Thanks so much for reaching out. We certainly understand your concern and are so glad you’ll be trying the product. 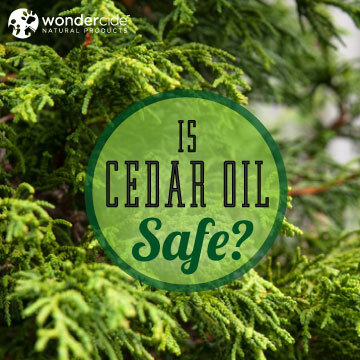 Non-beneficial insects such as fleas are scent-driven and much like ammonia to humans, cedar is overpowering for them. If they are unable to evacuate the area, they simply close up their breathing pores and suffocate themselves. We look forward to hearing how the product works for you! Spent 1st night this week un”pest”ered by pests, fleas. This is after a week of doing what I could sans Wondercide. Yesterday, sprayed comforter + duvet, completely drenching w/”Pets and Home,” then left to ventilate outside for day. Put it back on bed at bedtime…and ta-da! Whatever fleas were still around bed area were either killed or went screaming into the woods. Was not bothered once. Slept soundly into morning. Comparable great news, senior kitty Max, who now spends most time in bedroom, has not had asthma aggravated! 🙂 . So pleased. Though I have a ways to go to fully eliminate the problem, I’m on my way, and all because Wondercide proving again and again it can prove effective while staying user-friendly to 4-leggeds, 2-leggeds + home and earth in general. God bless you and yours and can’t thank you enough for superb customer service and helping me out of this nightmare that starts w/ the letters FL— .Best to you and thanks for making such a product available! Thank you, Nancie, for your kind words! ? I know you keep repeating it is food grade, etc. But we have a Koi pond and my husband needs reassurance that they are going to be ok if overspray happens. Thanks for your question, Anna! While it is safe to use our outdoor pest control products near ponds and bodies of water, cedar oil is a marine pollutant, so you would not want to spray it into the water directly if there are fish and other aquatic animals present. We even recommend not treating right around the pond it so that it will reduce runoff. Hopefully, that information is helpful, but feel free to reach out to us at hello@wondercide.com if you have further questions! Hi. So far this is the only natural product that has worked, without making a complete mess (DE). I think there may have been a flea on the lower part of my cat’s eyelid, on the skin part, so I put some on a q tip and treated her under the eye, definitely not in the eye and some did get in her eye. I feel really bad. I did take a washcloth and wet it slightly and tried to dilute what’s on her eye, but I can tell she’s still irritated but she seems okay though but is kind of keeping one eye less open than the other, but I also noticed she’s can open it okay. Should I be worried? I think this would be similar when we get something (natural) in our own eyes, that it hurts for while but eventually passes. Thank you! Thanks for your question! The product is completely non-toxic; and although it isn’t ideal to get it into the eye, it should absolutely rinse out without any short or long term damage. We’ve never heard of any damage being caused by the product to a pet’s eye. Do keep us posted; and of course, let us know if you have any questions – we’re always glad to lend a paw. My youngest cat is licking it all off, will it harm him to ingest so much of the product? I sprayed an old, clean sock with the product and then applied it to his head first, then the rest of his body. Will he be OK? Thank you for reaching out to us about your sweet cat, and for your desire to protect your family with safe, natural products. Our Wondercide products are classified as GRAS by the FDA (generally recognized as safe) and contain only human-grade ingredients. You can rest assured that your cat can groom himself without fear of harming him with the product. You might notice some drooling if he ingests a lot of the product, but there are no toxic effects, as our products are phenol-free and developed to be safe for cats. Using a clean cloth or clean sock to apply the product is a great way to avoid oversaturating your cat. You could also spray your hands and massage the product into his fur this way. We hope this helps. If there are any other questions you have for us, please do reach out again soon. Has this product been tested on cats? My vet suggested that I ask. We appreciate that you reached out with questions, Jen. Wondercide only uses ingredients that we know to be safe for both pets (cats included) and people. Everything that goes into our product is 100% naturally-derived, non-toxic, and human food-grade. We are a cruelty-free brand, and do not not perform laboratory animal testing (other than on the insect pests our products are guaranteed against). That said, our products do go through informal home testing (outside of a laboratory) with our own pets, and thousands of cat owners use our products with great results. In addition, we formulated our Pets+Home spray with the guidance from holistic veterinarians to ensure superior product quality, performance, and safety. I hope this helps, but please let us know if you have any additional questions. Have a great day! it could also be a host to pests. And among the many kinds of parasites that it could bring in are the fleas.